The Pacific Ocean has a plastic problem. Here's the bold plan to fix it. Environmental group will use floating nets to snag plastic debris. In the Pacific Ocean halfway between California and Hawaii lies what’s become known as the Great Pacific Garbage Patch, a huge jumble of fishing nets, bottles, bags, and other plastic items as well as tiny bits of plastic debris. “It’s a vast plastic soup,” says Kahi Pacarro, executive director of Honolulu-based Sustainable Coastlines Hawaii. We’ve known about the existence of the patch since the mid-1980s but weren't quite sure about its size until a study published last March showed that it holds at least 79,000 tons of plastic and covers an area three times the size of France. And the aggregation of trash is growing, says Richard Thompson, a marine biologist at Plymouth University in the U.K. who has studied plastic waste and wasn’t involved in the paper. “It’s a big cause for concern,” he says. The patch presents more than an aesthetic problem. The debris entangles and kills all sorts of sea animals, including turtles, dolphins, and whales, and breaks down into microscopic particles that are consumed by fish and filter feeders like mussels and oysters. When we eat these animals, we may, in turn, consume those particles — with unknown effects on our health. And the Great Pacific Garbage Patch isn't the only one out there. It's technically known as the eastern Pacific Garbage Patch because there is another collection of trash in the western Pacific. Similar aggregations can be found in the oceans' four other circular currents, or gyres, with one patch each in the South Pacific and Indian Ocean and two in the Atlantic. Some researchers object to the term "patch," as it connotes a heap of visible plastic, when in reality most of the trash floats invisibly in small pieces below the surface. The growth of the patches is fueled in large part by our preference for single-use plastic products and a lack of recycling — and a new report by the British government indicates that levels of plastic in the ocean could triple by 2050. But help may be on the way. A Dutch nonprofit known as the Ocean Cleanup is moving forward with an ambitious plan to eliminate the patch using a fleet of what it calls “floating screens” — essentially huge floating nets designed to snare debris as small as one centimeter in diameter. The nets, supported by pontoons and driven by winds and current, will store the debris until large ships come by to collect it. The organization, which has raised around $35 million, envisions building and deploying up to 60 of the screens within the next few years. It’s now completing construction of the first one, with plans to try it out from the organization’s base of operations in San Francisco Bay later this month. If the screen works, plans call for it to be tested farther out at sea in May and then towed to the patch and set loose in August, with the first batch of trash to be brought stateside by year-end. 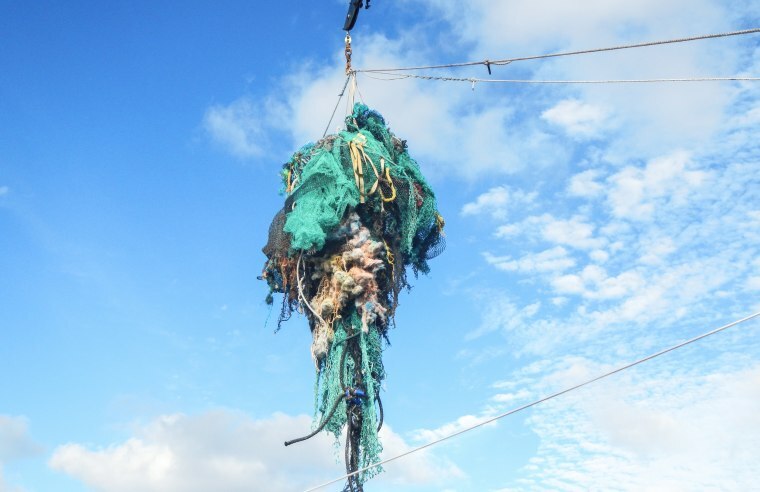 The team calculates that its fleet of floating nets could collect half of the plastic in the Great Pacific Garbage Patch in a span of five years, snagging up to 50,000 tons of trash annually. It’s not yet clear that the organization’s plan will work. Even if it does, some experts question the wisdom of trying to clean up the patch when so much plastic debris is still being added to the world's oceans. Thompson says it makes more sense to find ways to stem the tide of this trash from entering the environment — by passing laws to encourage recycling, for example, and convincing consumers to reduce their purchases of plastic products and do more to recycle the ones they do purchase. Marcus Eriksen, co-founder of the 5 Gyres Institute, a Los Angeles-based nonprofit dedicated to fighting plastic pollution, agrees with Thompson. “You’re going to get a much bigger bang for your buck by preventing plastic from getting to the ocean to begin with,” he says. But The Ocean Cleanup folks don't see things that way. Lonneke Holierhoek, the group's chief operations officer, says the group recognizes the importance of finding ways to limit the flow of plastic waste into the environment — and has done some research on ways to remove plastic from rivers and closer to shore. But for now, at least, their sights are set on the garbage patch.